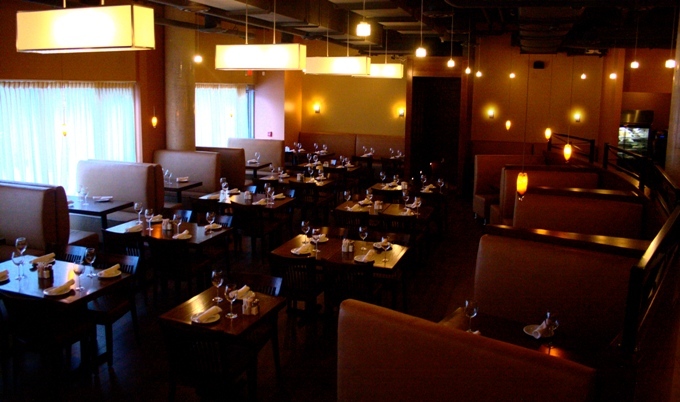 In the time since this post was written, Trella restaurant has closed. I was trying to figure out where to have my sweetheart take me for an early Valentine’s celebration, when Erin gave the core NCVA volunteers some exciting news: trendy Italian restaurant, Trella was going to join the NCVA’s newly launched Restaurant Outreach Program, and in a big way. As I read over their new vegan menu, developed with Erin’s coaching and encouragement, my mouth watered. It was true Italian favorites veganized… and I didn’t even have to cook! Trella’s dining room. It’s actually a lot brighter than this photo would suggest. Yves and I agreed we’d give them a try, partly because it sounded so delicious, but also partly to give them a test run before encouraging other people to dine there. Trella is not someplace I’d ever been, or even heard of before they joined the outreach program. Quite frankly, I’d rather just go to places where a) I know they have lots of vegan options for me, because I have little interest in dining on limp salad, and b) I don’t have to ask a zillion questions. In the case of Trella, Erin had already paved the way and given them the best vegan education she could. But I have to admit. I still felt some pre-dinner anxiety. What if they ran out of Daiya? What if they used real sausage instead of faux? What if they had no idea what I was talking about when I asked for the vegan menu? 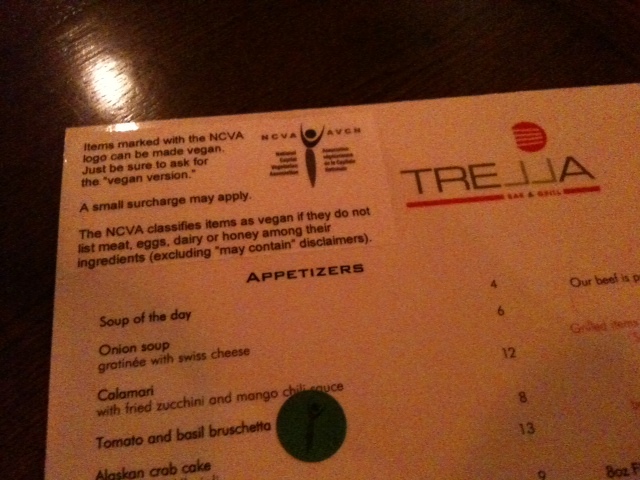 The Trella vegan menu, complete with NCVA leaping carrot. It turned out my fears were unjustified. I was pleased to note that Trella is spacious, bright, and modern-looking, although, it wasn’t as busy as I’d expect it to be on a Friday night. I had made a reservation, and our table was already waiting with the vegan menu laid out for us. I have been involved with the NCVA for more than four years now, and it was a thrill to see our logo, and little stickers with the leaping carrot, all over the menu. I may have even squealed. Restaurant outreach is something I’ve wanted to do for some time, but without enough volunteers it simply wasn’t feasible, at least not until Erin came along and made the project her own. It was amazing and almost moving to see the fruits of her labour. We forgot to take a photo until we’d eaten all but one piece. It came with four pieces. It was equally amazing to taste the fruits of her labour. Yves and I started by ordering their bruschetta as an appetizer. But Trella wasn’t about to let us go hungry. Before we could even order the server brought us some buns (white and brown) with oil and vinegar to dip them in, garnished by olives which the server assured us they were vegan. (Are some olives not vegan? I wouldn’t know, I don’t like them.) 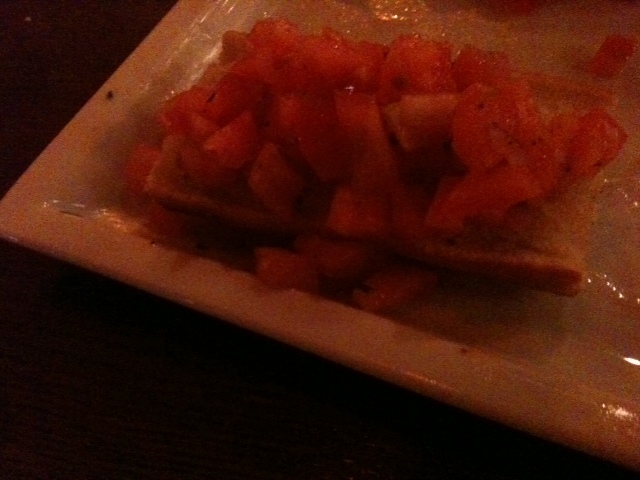 The bruschetta arrived, piled high with ripe and garlicky tomatoes. We were off to a good start. For our mains, we ordered two entrees to share: Tagliatelle Salsiccia (vegan pasta, vegan tomato sauce, roasted faux Italian sausage, garlic, roasted red peppers and shallots), and the Diablo pizza, topped with Daiya, hot peppers, artichoke hearts, grilled faux chicken, and onions. 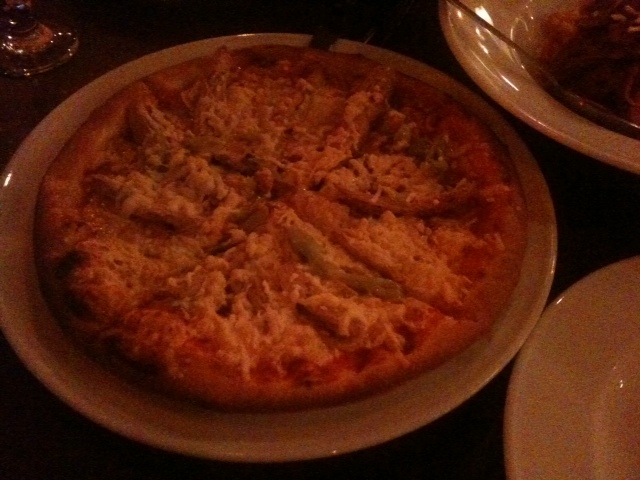 The Diablo pizza at Trella, made vegan. Oh. My. God. It was absolutely fabulous. And I’m really glad too, because the server and the owner/manager presented the dishes to us with such hope in their eyes that it would have been devastating if the dishes were awful. But they didn’t. They were amazing, and we savoured every single bite. By the time we were finished we were almost explosively full, but I bet if there’d been more on our plates we would have just kept eating anyway. Pasta garnished with a basil leaf. Maybe it was just the novelty of eating a vegan pizza with vegan cheese, I don’t know. I’m afraid of over-stating how delicious my meal was, because I know that when expectations are raised it can often lead to disappointment. 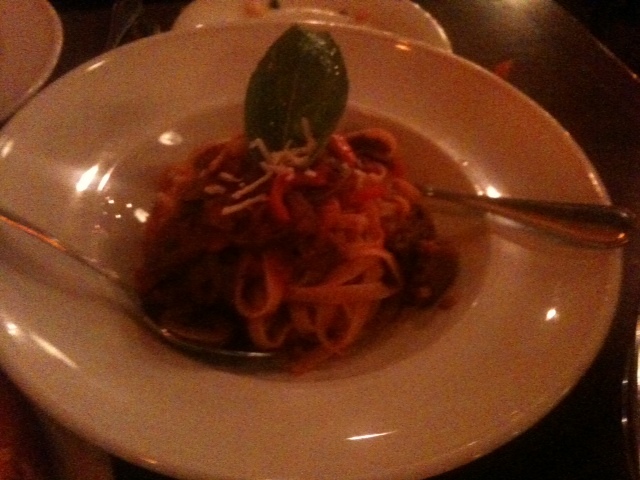 But we were very satisfied and satieted by our meal, and even tried to emulate the pasta dish for tonight’s dinner. It was good, but Trella’s was better. Theirs had satisfyingly fat linguine ribbons and a perfectly tangy tomato sauce, and tofurky sausage medallions. And I dread the next “pita pizza” I make because it definitely won’t have the same soft doughy crust that Trella’s pizza offered. We didn’t eat dessert at Trella, as they don’t have vegan dessert (yet!) We were actually too full for dessert, but that didn’t stop me from chowing on an Auntie Loo’s peanut butter and chocolate cupcake anyway. Trella will also be serving brunch on the weekends. Stay tuned for a review from Erin in the coming days. I asked Trella if they offer the vegan menu everyday and they do. They just ask that you try to make a reservation and mention that you’re ordering off the vegan menu so they’re prepared.